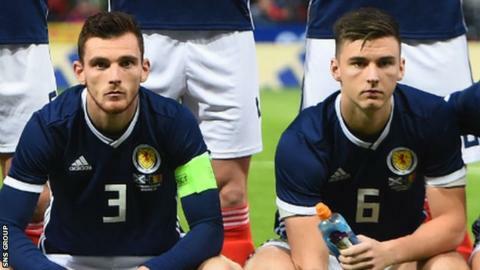 Celtic left-back Kieran Tierney will miss Scotland's opening Euro 2020 qualifier in Kazakhstan on Thursday with a hip problem. Tierney, 22, was expected to replace captain Andrew Robertson, who misses the game after having dental surgery, but has not trained this week. Celtic midfielder Callum McGregor will now captain Alex McLeish's side. Liverpool's Robertson will join the squad for Sunday's game in San Marino, and Tierney could also be available. What are the key decisions facing Scotland boss McLeish? McGregor will win his 10th cap against Kazakhstan, with McLeish saying the 25-year-old is "a very good ambassador" both on and off the pitch. "He's an unfussy player, nothing seems to bother him and he's a great example to the rest of the squad with his professionalism," he said. "To captain the team is a phenomenal honour and Callum will take it in his stride. He's not a snarling, biting captain, he's one who will encourage the players and try and get the very out of his team-mates as well as doing his own job very well." Scotland are playing Kazakhstan, ranked 117 in the world, for the first time. "We want full points from the smaller teams but if we don't respect the opposition, then it can make things so difficult," said McLeish. "We must be at our best level. We have prepared well and we are ready." Jordan Archer, Barry Bannan and Charlie Mulgrew dropped out prior to the squad's departure, with Liam Kelly and Stuart Findlay called up. Aberdeen captain Graeme Shinnie, uncapped Kilmarnock centre-half Findlay and McGregor could deputise at left-back, or manager McLeish may go with three central defenders. However, potential wing-back candidates Callum Paterson and Ryan Fraser will not be involved due to concerns over the artificial surface in Astana. The manager was reluctant to give too much away on his team thoughts but said Shinnie, mostly deployed in central midfield by Aberdeen, is "certainly a candidate". Callum McGregor is good enough to play for a Liverpool or Arsenal in the next year or so. Technically, he's that good and we should celebrate that more. We'll miss the players who aren't available but we've tried experience for 15-20 years and not qualified for anything. It might be time for a total change, play the younger players and just go for it and see if these boys can grow. It's all well saying Kazakhstan aren't a good side, but their teams have caused plenty of problems to Celtic and Aberdeen in Europe in recent years. If Scotland want to challenge for the top two positions they have to win this game. It's difficult for McLeish with so many injuries, especially in unsettling the defence. There might be a change of shape - McLeish could go three at the back. Defenders: David Bates (Hamburg), Stuart Findlay (Kilmarnock), Scott McKenna (Aberdeen), Stephen O'Donnell (Kilmarnock), Liam Palmer (Sheffield Wednesday), *Andy Robertson (Liverpool), John Souttar (Hearts), *Kieran Tierney (Celtic). Midfielders: Stuart Armstrong (Southampton), John Fleck (Sheffield United), John McGinn (Aston Villa), Callum McGregor (Celtic), Kenny McLean (Norwich City), Scott McTominay (Manchester United), *Callum Paterson (Cardiff City), Graeme Shinnie (Aberdeen).